In 1987, Samuel Beckett asked Michael Colgan to produce ‘Waiting for Godot’ at the Gate, and requested that Walter Asmus - his assistant director on the famous Schiller Theatre production - direct. Hailed by the international press as “the definitive Godot”, this production has since toured all over the world, including China, Melbourne and Toronto, receiving unprecedented critical acclaim. It was also a central part of the Gate’s Beckett Festivals in Dublin (1991 and 2006), New York (1996) and London (1999 and 2006). 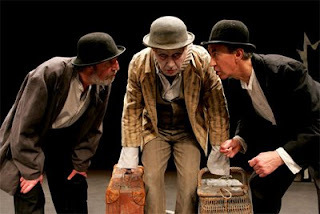 As part of the theatre’s 80th anniversary celebrations, the Gate’s acclaimed production of Waiting for Godot will tour to 40 venues across the 32 counties of Ireland, playing for one night only in each venue. The tour, which will also mark the 20th anniversary of this now legendary production, will include the original cast members. Ever since I heard about this, I’ve been waiting for Godot to arrive. I was quite disturbingly excited that this wonderful production would come and play in my local theatre – a place I know and love very well. The Castlebar performance was sold out months in advance and the day itself did not disappoint. From early morning the techies were in, shifting, building and lighting the simple-yet-deceptively-complex stage set. In the late afternoon, a series of parking spaces were cordoned off out on the street and a little later the ‘Godot Bus’ arrived with the cast on board. These venerable actors are certainly traversing the country in some style. The huge bus is emblazoned with the iconic image from the production – Vladimir supplicant to the moon – and it was great to see a piece of theatre bring with it this level of buzz and excitement. Great? It was bloody amazing. So I went to see the play and I really loved it. I really did. However I felt a bit strange afterward telling people how great I thought it was because the general vibe among the post-show audience was that it was ‘heavy’, ‘hard-to-follow’, ‘obtuse’ and/or ‘nothing happened. This all surprised me. You see I’m not an intellectual guy – you’ll have picked that up if you’ve been visiting here for a while – I tend to gravitate towards ‘easy’, ‘entertaining’ things. Heavyweight tomes can leave me cold. I just didn’t find Godot to be hard-going at all. I think it’s funny, moving, emotionally involving, touching, thoughtful, witty, smart, and fun… yes fun. So when some people were busy telling me how bemused they were by it all, I initially thought I understood – I though they had brought all their prejudices into the theatre with them. They expected ‘tough-going’ and a ‘lack of incident’ and so that’s what they got. I’ve changed my mind about that since. Upon ‘mature reflection’ as some of our politicians say. I think I enjoyed it more because I’ve spent time with it over the last few years. I was involved in a rehearsed reading of the play a few years ago – I played Estragon and we had a lot of fun with it and it went over pretty well with the full house. In boning-up for the part, I re-read the play many times and I also watched the Gate Production on DVD several times – the self-same production that has now played Castlebar. My new theory is that my ‘little learning’ helped me enormously in enjoying the play on the night. It is a lesson I intend to remember. The cast who came to give us the play were exemplary – and I mean exactly that. There was no weak link in that foursome. But for me, having now seen it again, I am more convinced that ever that Godot is not an ensemble piece. For me Godot has a ‘hero’ – a central character. That hero is Vladimir. Even Estragon, who shares so much time with Vladimir seems dependent and somehow secondary to him. Vladimir seems to me to be heroic – an ‘everyman’ lost in a meaningless world, looking out for redemption but never losing sight of the truth of the repetitive, time-killing, pointless nature of his existence. When ever I go to see a play, I love to become engrossed in the ‘show’ but I also love to pull back the curtain of artifice afterward and learn as much as I can about how it was from the stage looking down into the audience. I met the cast of Godot afterward (no great trick to that, anyone who wants to can do it) and I greatly enjoyed speaking briefly to them all. The actors impression of our Castlebar audience seemed (to me) to be that we were a quiet, slightly-unresponsive lot. I have to say that wasn’t my impression. The production made use of enormous freezes in the action where everybody sits immobile and silent… and waits. In Castlebar the audience waited right along with them. This impressed me quite a lot and I though it actually worked very well. I would imagine other audiences might have shuffled and giggled nervously at these moments – as time seemed to stop completely. But we were very well behaved – at least I think so anyway. So – listen - if the Godot Bus comes up your road in the next few weeks, do flag it down and try to persuade it to stop for a night and play. Finally, let me share this little titbit (are there any big titbits?) with you. My good friend Mary Carr passed this on to me. Where does the name ‘Godot’ derive from? Many people say it refers to ‘God’ and that carries a little weight (I suppose). Mary has a good angle on it which I never heard before. Beckett was Irish (‘go way! … no he was!) and was familiar with the Irish language. In Irish, ‘Go Deo’ (pronounced ‘guh joe’) means ‘forever’. This, she reckons, is where ‘Godot’ came from… ‘Waiting for Forever’ and that’s where my title for this post came from too. My favourite story regarding the origin of the name 'Godot' is this. Beckett was walking through Paris when he observed a group of people outside a velodrome. He asked someone in the crowd what was going on. 'We're waiting for Godeau', came the reply. Godeau, apparently, was a famous cyclist. I love plays, and went to quite a few while I was in Dublin. I don't know if they're coming here, but if they do and the tickets are affordable (less than $75) you better believe I would go! Thanks for the interesting review and your self-analysis. Over the years I've discovered that many people will refer to plays, poems, or even novels as "heavy" if they didn't understand them. Obviously, Godot struck a chord with you, and we (the readers) are better for it. My first experience of Godot – indeed, my first experience of Beckett – was courtesy of The Open University. I had to get up at some god-awful time in the morning to see it. This would be thirty years ago. I was nineteen. Vladimir was played by the incomparable Max Wall and Vladimir by Leo McKern. I was gobsmacked and made my wife and a girl who was staying with us at the time get up the following morning with me to watch it. To my surprise the thing did not grab them in the same way. The next time it was on, some months later – again at the crack of dawn – I got up alone to watch it and I would dearly love to have a copy of that, my first Godot. I agree with you though, I have always seen Vladimir as the hero of the piece but then he's the thinker of the two; Estragon feels. I also have the DVD you speak of and it's not that long ago I sat my daughter down to watch it. I would agree, if any two men were born to play Didi and Gogo then it was these two. Nist post Ken! In Norway earlier this year the producer stopped a female-version of the play in a Norwegian theatre. They refused to see a version have 3 females in the play. There were plays set up here a few years ago but I didn't get the chance to see it. I'm not sure what you are suggesting.. is it that the play has become harder toget over the intervening years? I saw it in its heyday when it was fresh amd really controversial. Okay, I didn't get it straight off, 100%, but wow, how I enjoyed it! Interesting. See my post Monday. Dominic: I found your story very interesting and I followed the link you kindly supplied to even more interesting information, thanks indeed. Hi Sharon: Yes, 'I don't understand' and 'heavy' do seem to go hand in hand, don't they? I am interested that you agree on my Didi-as-hero viewpoint - for some reason I didn't think you would. Oh and I never mentioned the other actor - I always think of Godot as a four-hander but, of course, it is five. The little boy was portrayed in the production as quite angelic and a little mystical and other-worldly - the kid playing it was great but I wasn't gone on the reverential treatment his part was given. Hiya Dave - no, I don't think the play is harder to get, really. All I was trying to say, without sounding vain about it, was that the work I have done with the play in previous years has constituted a sort of 'study' of the text and I think I was better equipped to enjoy the evening as a result of my groundwork. It sound kind of obvious when I put it that way. perhaps the converse is more interesting - some things take a little work to enjoy but you enjoy them all the more for having put the work in. Without a doubt, Ken. I can see him now at the end of the second act, with his eyes screwed up - I've nearly worked it out, I've nearly worked it out - and then Gogo distracts him and the day is done to begin again. On the female Godot, just to mention, Beckett was vehemently opposed to any performance with females and he was surprisingly tolerant of innovative approaches to his work which is not how he is usually seen. But a female Godot...no way. It seems to me a person doesn't pop into an existentialist play on whim just on the way to the pharmacy/chemist-- you tend to enjoy those things already. Or at least know what they are and wish to see them live. I love this. I've seen Godot three times: twice in French and once in Irish, and I'd love to see it in English someday. I hated it the first time I saw it, and liked it better after. Thanks for sharing the Go Deo insight; I wouldn't put it past Beckett to come up with a title that intrigued on several levels, this way. The theories may well ALL be right. Thanks for reply Jim: It was fun to spot some little differences in this production to the 'DVD' one. Lucky used his 'Quaquaquaque' as if he were a goose, chasing the curious Didi and Gogo away. And the moon, the moon was *so* beautifully done... really. It's a good point Jenn - the thing is, this was a high profile, dare I say a 'society' event for the town so some of the people who came really did not know quite what they were in for. I really don't think it needs to be feared as an existentialist play. Alas, our local playhouse has closed down. Not enough support in these troubled financial times and this being a mostly rural area. I'll have to check out Newberry to see if they're offering Beckett.